No posts this weekend, but I was really busy! The yard sale was AWESOME. We had SO SO SO much fun and I think everyone made at least a little extra cash. 🙂 I know we managed to clean our inventories at least a little! People will begin picking up their items today [Monday] but if you want to stop by before late Monday night to see what’s left, please feel free. 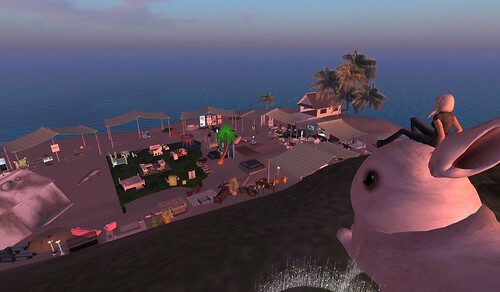 All items not picked up by Monday night around 10 or 11pm SLT will be returned. I’m going to try to return things one by one just so you guys don’t have a big blob in your lost & found so it’s easier for you to pack away for the next sale or delete it. 🙂 Thank you all so much for such an INCREDIBLE turn out. I never expected it would be so huge!! And yes, we will most definitely do this again, maybe in November after the Halloween sales & hunts, but before the Christmas/Winter hunts? Granny Wilma coming to see what bargains she could get. SySy, me, Sehra & Nikki holding a noob rodeo – complete with Blingis! Aisuru getting a ride from the Wandering Noob. Wilma [in her more normal state] and me taking a sit while Tyson … does stuff. Thank you again to everyone who came out to sell, and big thanks to everyone who came out to buy! It was a most amazing weekend, but I won’t be sorry to have the island get back to our normal [well, normal for us] routine. 🙂 Goodnight! I like that! And that…and that…. It’s been a daydream of mine that I become so incredibly famous that designers close sims for me to shop on alone, or simply bring their items to my doorstep. Hey, I said it was a daydream! As I’ve mentioned before, a bunch of my friends and I are having a Yard Sale this weekend on my island. We started setting up last night and this is as close to my daydream as I could have ever wanted, because there is SO MUCH STUFF already!! I spent time last night hanging out on one of the couches with a couple of friends and looking at all the stuff. And then I bought the couch. LOL! I couldn’t help it. I liked it and it was cheap and it will go in one of my skyboxes!! Of course, when I logged in today, I noticed new stuff. Including this Sad Bunny chair that SySy put down. I knew the bunny had to be mine. As for me, I’m trying hard to keep myself up in my skybox. Otherwise I’m going to be doing way more shopping!! Are you drowning in inventory? Are you in need of some extra money? Then keep reading! My friend Ulaa Coronet came up with the idea, and we are holding a big Yard Sale on my island this coming weekend! Box up that transferable stuff, slap a price on it, and come sell it! And if you have nothing to sell, then just come and buy things! Believe me, there are going to be some NICE clothes, accessories and furniture out there! The sale will run from Saturday, September 12th at 8:00am SLT to Sunday evening around 9pm SLT. If you are interested in participating, please contact me by this Thursday. I’ll have the selling area set up Thursday evening and those participating can come bring their items to set up starting on Friday. Woot! I love love yard sales! I’m a little sad. No Lotus pics ever graced my inventory. How will I ever find out what happened to it?! Anyway, I was going to show this off in my style blog, but honestly? I’m really really lethargic today. So, I’ll show it here because I really like it. 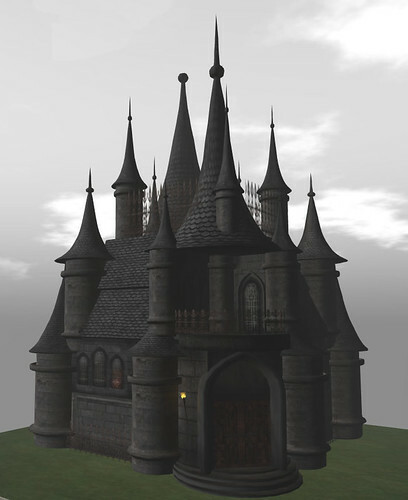 This is my new castle from Luna’s Boutique. I love it. Luna’s is having a sale right now where everything is $176L. Maybe it’s an all the time sale. I don’t know. But what I do know is that this castle rocks. It comes furnished too. Not a lot of furnishing, but it’s still nice inside, if a little dark. There’s even a secret dungeon. It’s really cool. The bedroom is nice too. With the furnishing, it’s like…225 prims. Something like that. I’m not in world so I couldn’t tell you. But it’s a little over 200 prims. Go buy it and find out for yourself. I have a real love of butterflies. No, it hasn’t replaced my love of bears, but I do love love butterflies. So when the awesome Aisuru mentioned some new butterflies on plurk and then asked if I wanted a tp to go see them, I took the teleport right away. 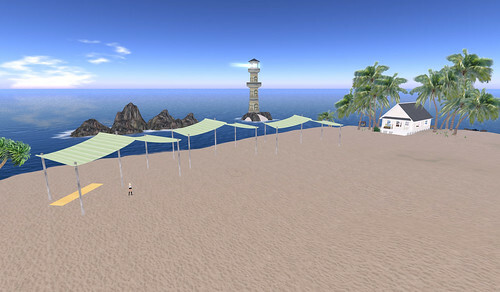 Since I’m not in world at the moment, I couldn’t tell you the name of the store or the creator, but just use this SLurl and you’ll find them. They’re in a mall, so it might be laggy. But they are AWESOME. They flutter around so so pretty and it’s only one prim!! I’m using 3 prims for all the butterflies in that picture. Oh, and they’re only $10L and mod/copy. So go buy them. I was lucky enough to meet ~flirt~ designer Skinkie Winkler last year when I fell in absolute love with one of her jewelry sets. I couldn’t believe someone who could do such awesome work would also be so nice! If I was that talented, I probably wouldn’t be. :-p I kid, I kid. I’ve also been lucky enough to have had Skinkie as one of my island neighbors for the past few months. Everytime I see her dot on my mini map, I always have to wonder what she’s working on! That being said, let’s take a look at a couple of new sets from ~flirt~! Bloom started out with just a pretty little ring. I had blogged it back in December and it was definitely one of my favorite rings to wear when I could. But now Skinkie has added much more to the set! A gorgeous necklace, beautiful earrings, and a fabulous bracelet completes the Bloom look. Everything is delicate, which is something I absolutely appreciate in jewelry in both lives. Also, the jewelry comes with color changing scripts for the gem and the metal, so you can easily mix and match to your wardrobe. And you will definitely want to, because these can be worn with a casual outfit like jeans and a tank top, or with a formal gown. The Bloom set comes with a necklace, dangling and stud earrings [the stud earrings not shown here], bracelet, and ring. For this weekend only, the set is ONLY $1000L!!! You must must must go pick it up before the price goes back to its normal price, which I believe is $1500L. If you bought everything separately, it would run you $2150L. Although it is worth every single $L of that, it’s more fun to get a deal! For those of you who aren’t really into the dangling jewelry, or like something a little bit thicker, Skinkie has come out with the Tiny Bloom set! The Tiny Bloom set consists of a metal choker, a wider bracelet, and adorable stud earrings. I really like the way the set is both delicate and heavy. It also has the texture change options so you can get just the right look for all your outfits. The set is on sale this weekend only for just $500L and after that will be increasing to its normal price, so go pick it up fast! I’ve been wearing the bracelet with jeans since last night and it’s just absolutely perfect. Thank you, Skinkie, for allowing me to review your wonderful items! !